RAM authorization policies are composed of several rules. 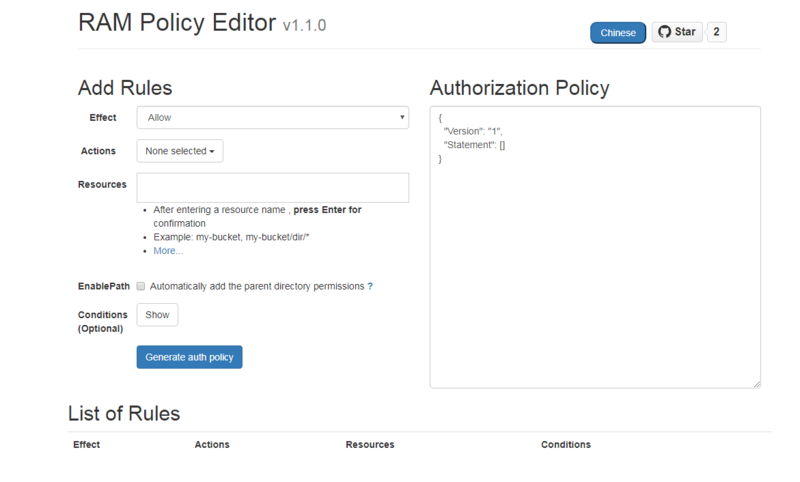 Using the RAM policy editor, you can add or delete rules one by one in the interface, and then a JSON file is automatically generated for the policy. After adding all the policy rules, copy the JSON file and paste it in the created authorization policy content box on the Access Control console. For detailed operation, see Create an authorization policy. In the RAM policy editor, you must set these fields for each rule: Effect, Actions, Resources, and Conditions. Specify whether access to this rule is allowed or denied. For more information, see RAM Policy Editor README. When the EnablePath option is selected, the preceding permissions are automatically added. Specify the conditions that must be met for authorized access. You can specify multiple ones. For more examples, see RAM Policy Editor README.